Dele Alli celebrates scoring against Chelsea on Sunday. 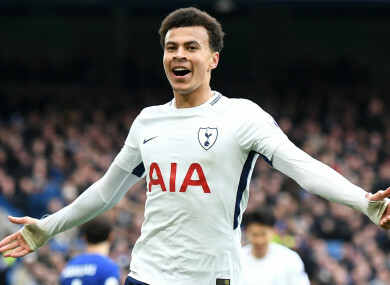 DELE ALLI EXPECTS his critics will still “have something to say” despite his match-winning performance in Tottenham’s Premier League clash with Chelsea. The England international scored twice in the second half to help Spurs to a 3-1 win, their first at Stamford Bridge in the top flight in 28 years. Alli had only scored six times in the league prior to Sunday’s match and has been criticised for a perceived dip in form compared to 2016-17, when he scored 18 times and provided seven assists in the Premier League. The 21-year-old, though, does not feel he had a point to prove against the champions and thinks there will always be scrutiny of his displays. “I’m sure people will still be disappointed with the way I’ve played. They’ll have something to say,” he told Sky Sports. “For me, it was just about helping the team as much as I can. Like I’ve said before, what people say, I try not to let it affect me as much as I can. Spurs boss Mauricio Pochettino was delighted with Alli’s display but feels he should be given “room to breathe” in his development. “He’s a great talent and I have no doubts about him,” said Pochettino.”Young players need room to breathe. Alli’s double came after Christian Eriksen’s stunning strike cancelled out Alvaro Morata’s opener for Chelsea. The result means Antonio Conte’s side are now eight points behind fourth-place Spurs with just seven league games remaining, but Alli does not think the race for the Champions League places has been settled. “I can’t say we’re guaranteed [a top-four spot],” he said. ”We’re in great form, we’ve got a few games left, so we just have to make sure we keep winning. We can’t get carried away. Email “Tottenham star Alli: I'll still be criticised despite heroics against Chelsea”. Feedback on “Tottenham star Alli: I'll still be criticised despite heroics against Chelsea”.